NAN: Give us some background information. When and how did you discover electronics. What was your first project? JOE: I got involved with computers and electronics in 1982, when I was 7 years old. My first system was an Atari 400 computer, an Atari 810 floppy disk drive, and an Atari 830 acoustic coupler modem. I spent every waking hour playing computer games, trying to write my own programs, and connecting to local bulletin board systems. I was continually experimenting and questioning. I remember learning hexadecimal by poking around with a binary editor and figuring out how to replace names on game title screens with my own. My brother, who is six years older than me, was also interested in computers and electronics. He would repair audio equipment, build telephone and computer gadgets, and disassemble broken electronics to scavenge them for parts. He had a cabinet that served as a junk bin for components and broken boards. When I did chores for him, like doing his laundry or cleaning his room, he’d let me pick something from the cabinet. I was 13 years old when I hand-etched my first circuit board to make a “ring-busy device.” The device was simply a resistor across the tip and ring of the telephone line that had an RJ-11 plug for easy insertion/removal. It would make the telephone switch at the central office believe your phone was off the hook (thus, providing a busy signal to any incoming caller), but would still enable you to make outgoing calls. It was a fun, mischievous device, but also very practical to prevent annoying phone calls during dinner. Right from the start, I had a strong emotional connection to all things electronic. I could just understand how technology was working even if I was unable to explain why. I knew early on that I wanted to be an electrical engineer. I wore this proudly on my sleeve, which didn’t help my ranking in the social hierarchy of elementary school! NAN: What have been some of your influences? JOE: In the early 1990s, when I was still a teenager, I joined a group called L0pht Heavy Industries (pronounced “loft” and spelled ell-zero-ph-t, http://en.wikipedia.org/wiki/L0pht). The L0pht was a clubhouse for Boston-area hackers who had met on local bulletin board systems and it was one of the first publicly known “hackerspaces.” The L0pht simply started as a place to store computer equipment, tinker with technology, and hang out, but it ended up as seven close-knit friends changing the face of computer security vulnerability research and disclosure. We would examine networks, software applications, and hardware products for security flaws. If we discovered a vulnerability, we would challenge the vendor to not only acknowledge the problem, but to fix it. This is now common practice, but back then, it was a feat practically unheard of. I looked up to the other guys in the group. All were at least six years older than me and they became my mentors (whether they knew it or not) for nearly the next decade. They helped me to focus my energy on projects that would have positive impacts for other people. They also helped reinforce the hacker mindset—that is, not being afraid to try unconventional solutions to problems, pushing the limits of technology, being dedicated to learning through constant experimentation, and sharing my passion with others. Being involved in the L0pht was a very special time for me and shaped much of how I view the world. NAN: You grew up and went to school in Boston. How did you end up in California? JOE: Being in Boston for nearly 28 years left me with a lot of history (both good and bad). Everywhere I looked, I had a story, a feeling, or a connection to a time or event. I needed a clean slate. I had just left @stake, a computer security consulting firm that we started out of the L0pht, and my wife (girlfriend at the time) had just finished graduate school. She was also looking for new adventures, so we packed up our stuff and drove across the country not really knowing what we were going to do when we got to California. We lived in San Diego for a few years and ultimately settled in San Francisco when I started work on Discovery Channel’s Prototype This! television show. San Francisco was a natural fit for us, and when the show ended, we decided to stay. Being close to Silicon Valley and its electronics stores (e.g., Jameco Electronics, WeirdStuff Warehouse, and HSC Electronic Supply) is quite useful, and I always get a thrill driving by the offices of chip vendors I use on a daily basis. NAN: You started your own product design firm, Grand Idea Studio, in 2002. Tell us about the company. JOE: Grand Idea Studio (www.grandideastudio.com) is a product design and licensing firm specializing in consumer/household devices and modules for electronics hobbyists. I started the company to create an environment that suited me best and would enable me to focus on what I loved to do. The majority of my work stems from ideas developed in-house or with my industrial design/mechanical engineering partners. I prefer to design simple, effective devices that serve a specific purpose. I’m all for using technology—but only where it’s needed—to make a product better. Much of my time is spent building prototypes or proof-of-concepts of ideas (though many of those don’t ever see the light of day) that are sold and/or licensed to suitable partners. Some projects I’ll release as open source (usually through a Creative Commons Attribution license), so others can learn from my experiences and build upon my work to make something better. I also teach a hardware hacking course at public and private events (www.grandideastudio.com/portfolio/hardware-hacking-training). The course focuses on teaching board-level hardware hacking and reverse-engineering techniques and skills. It’s a combination of a lecture and hands-on exercises covering the hardware hacking process, proper use of tools and test measurement equipment, circuit board analysis and modification, embedded security, and common hardware attack vectors. The course concludes with a final hardware hacking challenge in which students must apply what they’ve learned to defeat the security mechanism of a custom circuit board. Design engineers and computer security researchers don’t often join forces. Being both, I feel like it’s part of my responsibility to help make that connection. NAN: Tell us about your engineering experience prior to Grand Idea Studio. JOE: My most relevant and memorable engineering experience was when I worked for Continuum (formerly Design Continuum, www.continuuminnovation.com), a design and innovation consultancy based in West Newton, MA. I had worked on and off at the company during college and took a full-time engineering position in 1998. I was one of only two electrical engineers. We worked very closely with industrial designers, mechanical engineers, manufacturers, and clients to create innovative new products. Some key projects I contributed to were the A.T. Cross iPen (an early digital writing tablet) and the FluidSense FS-01 portable infusion pump (voted one of the best inventions of 2000 by Time magazine). It was during my time at Continuum that I learned about the product development and production manufacturing processes and sharpened my skills as an engineer. NAN: Tell us about your experience working on Discovery Channel’s Prototype This! television show. Do you have a favorite project? JOE: Prototype This! (http://en.wikipedia.org/wiki/Prototype_This!) was a short-lived engineering entertainment show that followed the real-life design process of a unique prototype each episode. Although we only filmed for one season (comprising 13 episodes), the show gained a “cult” status of sorts among engineers and makers. It aired on Discovery Channel in the US in late 2008, but is now airing elsewhere throughout the world. The show is also available on Netflix, making it accessible to viewers who may have missed the show the first time around. To be clear, I’m an engineer to the core, and I never had any intention of being in front of a camera as part of my job. But, the opportunity to show off engineering to the world in a way that was fun, entertaining, and somewhat educational seemed too good to pass up. Producing the show turned out to be a difficult and frustrating process, as we not only had to be on-screen television hosts trying to convey complex, technical builds in a way most viewers would understand, but we also had to actually engineer, design, build, and test the prototypes. We ended up building ridiculously crazy contraptions including “Mind Controlled Car” (Episode 1), giant 10’ “Boxing Robots” (Episode 2), and a “Traffic Busting Truck” that could elevate itself over other traffic and move in any direction (Episode 3). Each build had its own special flavor and design challenges and I actually enjoyed working on all of them. From an engineering point of view, I was most proud of the AirTrax control system (Episode 3), the PyroPack (Episode 6: “Robotic Firefighter Assistant”), and the underwater ROV controller (Episode 10: “Virtual Sea Adventure”). All of the documentation for my contributions to the builds, including schematics, source code, and development notes, is available at www.grandideastudio.com/prototype-this. Ultimately, the show proved to be unsustainable (from financial and time perspectives), but it was an unforgettable experience. The best thing is how the show continues to inspire future engineers. Nearly every day I receive e-mails from viewers asking for details about a particular build or what it takes to become an engineer, and I do my best to point them in the right direction. NAN: You’ve designed dozens of things—from computer memory-imaging tools to children’s products to medical devices. Tell us about your design process. Do you have a favorite project? JOE: I think my design process is very typical. I start by identifying and sourcing key components for the project. I’ll put together a preliminary block diagram and then build a proof-of-concept or prototype using a breadboard or PCB (depending on complexity and/or other constraints). If the design is an embedded system that requires firmware, I’ll start writing it as soon as the prototype hardware is ready. This lets me validate that each hardware subsystem behaves as required and, if necessary, I can easily make changes to the design. Once the hardware design has been sufficiently proven, I’ll move to a production design and form factor. Then, I’ll finish up the firmware, refine my documentation (which I work on throughout the process), and either release the design or move to production. If things go wrong, which they can sometimes do, then I may make multiple iterations of a design before it’s ready for production. When I’m in the throes of the design process, I’m obsessed with the work. I think about it constantly—on my daily runs, in the shower, at bedtime, and sometimes while sleeping. I try to anticipate worst-case scenarios, component tolerances, failure modes, and how the end user will interact with the device (both correctly and incorrectly). Every project I work on is currently my favorite and each project comes with its own challenges, successes, and failures. As soon as I’m done with one project, I’m looking for the next thing to do. I’m particularly fond of my work on the DEF CON badges. Held every summer, DEF CON (www.defcon.org) is the largest and oldest continuously running hacker event of its kind. It’s a mix of good guys, bad guys, government officials, and everyone in between, all having fun, sharing information, seeing old friends, and learning new things. For five years (2006–2010) I had the honor of designing the official conference badges, which were artistic, fully functional electronic devices. I believe we were the first large-scale event to provide electronic badges to attendees. It changed what people have come to expect from a conference badge. The challenge was to create something that scrutinizing hackers would enjoy, appreciate, play with, and modify, while staying within the budget (around $10 per badge in 10,000-unit quantities). The various badge designs have displayed custom scrolling text messages, turned off your television, transferred files over infrared, pulsed to music using fast Fourier transforms (FFTs), and provided USB functionality for computer control. They have incorporated technologies such as capacitive touch, RGB LEDs, microelectromechanical systems (MEMS) based microphones, “zero power” cholesteric LCDs, and microcontrollers ranging in size from tiny six-pin devices to powerful 64-pin behemoths. The physical PCBs used extremely complicated mechanical outlines, multiple layers of custom solder mask colors, and laser etching onto single-sided aluminum substrate PCBs. Full details about the badges, along with schematics, source code, pictures, attendee hacks, and related articles, are available at www.grandideastudio.com/portfolio/defcon-x-badge (where x = 14, 15, 16, 17, 18). NAN: Are you currently working on or planning any projects? Can you tell us about them? JOE: There will (hopefully) never be a shortage of cool projects to work on. I like to keep multiple plates spinning at one time, though I can only talk about some of those plates. At the recent 2013 DESIGN West conference, I released the JTAGulator (http://jtagulator.com), which is an open-source, Parallax Propeller-based hardware tool that assists in identifying on-chip debug (OCD) and/or programming connections from test points, vias, or component pads on a target device. Discovering available interfaces is a common step in hardware hacking or reverse engineering, as they are usually left unprotected and can be used to extract memory or affect the state of a system on the fly. A few similar tools exist, but they are either incomplete, closed source, or proof of concept. I wanted to create something that could be used in actual, real-world situations and that would help new people get involved in hardware hacking. The tool will also help to highlight the insecurity of leaving OCD interfaces enabled in production devices and hopefully serve as a catalyst for change in the engineering community (where convenience often trumps security). The JTAGulator currently supports JTAG and I will be making continued refinements to the firmware to add support for additional OCD protocols. Last year, I finished up the Emic 2 Text-to-Speech module (www.grandideastudio.com/portfolio/emic-2-text-to-speech-module), which has just started to appear in lots of interesting projects. The module is a self-contained, multi-language voice synthesizer that converts a stream of digital text into natural-sounding speech. It’s based on the Epson S1V30120 text-to-speech (TTS) IC, which uses the familiar DECtalk engine and is easy to interface to any microcontroller through a standard serial interface. Though embedded speech synthesis has been around for a while, there was no small form factor, low-cost solution readily available. So, I made one. A search for “Emic 2” on YouTube will result in various projects that use the module, including a tweet reader, a color-to-voice converter, a talking thermometer, an interaction with Apple’s Siri, and some singing demonstrations. Some other projects I have planned include experimenting with PCB reverse-engineering techniques, hacking with a BeagleBone Black and OpenCV, and designing a new RFID system. JOE: I’ve been increasingly concerned with the improper and (sometimes) socially unacceptable use of technology. From cameras at every street corner to mobile devices tracking your every move to Facebook and Google (among others) controlling your personal data, privacy has become something we’re slowly (and willingly?) losing. It’s a slippery slope that I don’t think many people will notice until it’s too late. The problem is largely driven by our society’s mass adoption of technology and taking that technology for granted. As an engineer and hacker, I strive to educate others about the unintended consequences of blindly using technology and hope it will make them more aware. We have a winner of last week’s CC Weekly Code Challenge, sponsored by IAR Systems! We posted a code snippet with an error and challenged the engineering community to find mistake! Congratulations to Chu Tin Teng of Fremont, CA, for winning the CC Weekly Code Challenge for Week 3! He’ll receive a CC T-Shirt and one-year digital subscription/renewal to Circuit Cellar. Line 7: string comparison should use cmp, instead of <=>. New line should read as “($aa cmp $ba) || ($an <=> $bn)”. Occupation: Tom is Principal Engineer of a large defense firm and CEO of KibaCorp, which he says is “dedicated to innovative educational technologies for the hobbyist, student, and practicing engineer.” He is also an adjunct faculty member at a local community college. Member Status: Tom has been a subscriber for more than eight years. Technical Interests: He is interested in robotics, embedded programming, microcontrollers, wireless applications, and engineering education. Most Recent Embedded Tech-Related Acquisition: Tom’s most recent purchase was a Raspberry Pi with direct GPIO connections. Control system theory is a branch of engineering that handles how to manipulate a dynamical system’s inputs to change the behavior or outcome of the system to something that is desired. The concept is simple enough to understand. In fact, humans do it regularly and intuitively when walking, driving, or playing video games—though many find it difficult to apply in practice when developing control systems for their projects. Often DIYers will purchase a controller then resort to the manufacturers’ recommended controller gains or they will tune the gains through a cumbersome trial-and-error process. In general, this method works fine for the patient engineer as long as the system is sufficiently simple. However, this method breaks down with so-called multiple-input multiple-output (MIMO) systems whose dynamics are coupled in such a way that renders this method impractical. But do DIYers need to worry about designing and building such complicated MIMO systems any time soon? Absolutely! And current trends suggest we’re already there. Control systems have been around at least as far back as the float-regulated water clock developed by the Greeks in the third century BC; however, control theory as a branch of mathematics wasn’t explored until much later in the mid-19th century. Since that time, the theory has been used almost entirely by professional engineers and mathematicians rather than DIY builders, but that trend is beginning to change. I’m not saying professionals with accredited degrees aren’t still the majority of control theory users; however, with the rise of inexpensive open-source development platforms, free online software libraries, and the vast array of available sensors and actuators, control theory is becoming a major requirement for part-time DIYers, as well. The simplest control systems are open loop. An open-loop control system is one in which the change in the input is not a function of the measured output. Open-loop controllers work best on systems that are predictable, repeatable, and robust to disturbances. A good example of an open-loop control system is a stepper motor where the user only needs to command a set number of steps and does not need to measure the motor’s final position to know with great confidence that it is where it is supposed to be. On the other hand, closed-loop control systems vary the input based on the measured output. To accomplish position control with a brushless DC motor for example, the user would need to feed back the measured position and adjust the input voltage appropriately. This closed-loop system is more robust to changes in the environment, but consequently introduces a whole new set of problems including stability, overshoot, settling time, and other loop performance measures. If you build a system with multiple closed-loop paths that must work together, you can see how the complexity grows. Kits for DIY projects (e.g., robotic sumo cars, maze-following robotic mice, six-axis stabilized quadcopters, and auto-piloted model aircraft) are now easily accessible to the individual. All of these projects rely heavily on control-system theory because they require multiple sensors and actuators working closed loop in conjunction with each other. These are MIMO closed-loop systems and they require more than clunky guess-and-try design methods. So where will DIYers turn to gain the knowledge necessary to develop the controllers for these complex systems in the future? Luckily, along with the capability for individuals to build these projects comes the means with which to learn the skills. With the rise of YouTube and other information-sharing sites, people now have access to more educational content than ever before. In addition to open-source hardware and software, there is also this “open-source” library of free knowledge where a creator can learn and share just about anything. The potential for video-based education is limitless, but it will probably won’t replace traditional education in classrooms any time soon, if ever. However, it is already proving an invaluable resource to many people who are looking to increase their knowledge base to tap into their full project-building potential. Continuing advances in hardware and software mean home projects are going to become more capable. With this capability comes a necessary complexity in their control systems. This should be celebrated because these projects come with a certain amount of pride, a sense of accomplishment, and valuable knowledge gained. The knowledge is generated and shared within the community, feeding back to a new generation of DIYers who, in turn, share their new gained knowledge. It’s a positive feedback system that shows no sign of slowing down. Brian Douglas is a control systems engineer based in Seattle, WA. He holds an MS in Aerospace and Mechanical Engineering (Dynamics and Controls) from the University of Southern California. Brian is the content creator of the Control System Lectures YouTube channel, which is dedicated to providing an intuitive and practical understanding of control system theory (www.youtube.com/user/ControlLectures). He has worked at The Boeing Company since 2003 developing satellite and aircraft guidance, navigation, and control systems. He is also married to a wonderful wife who supports him with all of his numerous hobbies. In the June issue of Circuit Cellar, George Adamidis, a physicist and electronics engineer from Greece, shares his design for a 1.5-GHz frequency counter. His design is based on an 8-bit microcontroller, but his modifications enable using the device as a 28-bit counter. Here is a picture of the complete project. Adamidis says it is “remarkable” that his frequency counter is actually a 28-bit counter. This is the 1.5-GHz frequency counter’s block diagram. To read more about the theory of operation, hardware, and software behind Adamidis’s design, check out this month’s issue of Circuit Cellar. It’s Wednesday, which means we’re announcing the winner of last week’s CC Weekly Code Challenge, sponsored by IAR Systems! We posted a code snippet with an error and challenged the engineering community to find mistake! Congratulations to Chris Austen of South Yorkshire, UK, for winning the CC Weekly Code Challenge for Week 2! He’ll receive a CC Gold issue archive on a USB drive. Line 5: ROT should be SWAP ROT for the given stack effect – though -ROT will work too. It’s Wednesday, which means we’re announcing the winner of the most recent CC Weekly Code Challenge, sponsored by IAR Systems! Congratulations to Peter Baston of Flintshire, UK, for winning the CC Weekly Code Challenge for Week 1! He’ll receive an IAR Kickstart: KSK-LPC4088-JL. Peter’s correct answer was randomly selected from the pool of responses that correctly identified an error in the code. Peter answered Line 9: There should not be a “*” before argv[i]. ALTSpace is a Community Art Workshop in Seattle. Creative people of all kinds share this spacious workshop, teaching, experimenting, making and learning. Members can spend time bouncing ideas off one another, hold or attend classes, work away from home and have the space to get even large projects done. 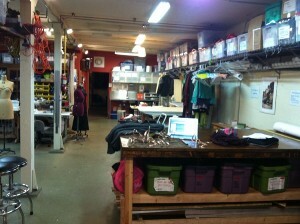 We have a total of about 2800 sq ft. We have two garage spaces for industrial machines, loud and dirty operations. (about 700 sq ft total) The rest of the space is for personal workspaces and public areas for working, meeting, hanging out. We have 2 showers, 2 bathrooms, a kitchen, a laundry room and an outdoor patio. Full list of ALTspace’s tools & equipment. A laser cutter would be our next purchase. Yes, we do quite a bit of electronics. One of our more well known projects, the Groovik’s Cube (A 30ft playable Rubik’s Cube) is an arduino driven project. We first built the cube as an art project for Burning Man 2009 and we’ve since been working hard to try and bring this project to the general public. We’ve been collaborating with the Science Center since summer ’10 and we’ve been doing a number of refurbishments including a brand new light-weight aluminum structure to create a neater look suitable for an indoor museum environment. 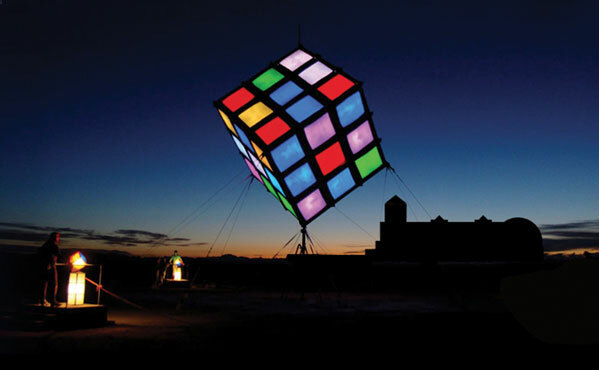 Groovik’s cube is a fully playable, LED driven Rubik’s cube, hung from the ceiling, corner down. (the motion is of course simulated, not mechanical, i.e. the colors move around, not the structure itself). It can be played and solved by the visitors. A particularly interesting feature is that we have split the controls into 3 stations placed around the cube, each allowing only one axis of rotation. This means 3 people have to collaborate together to solve it. The stations are ~30-50 ft apart from each other. This makes the puzzle considerably harder with a current record solution time of 50 minutes (achieved on Friday night @ Burning Man 09). It also turns a very introverted game into a collaborative challenge which is fun to watch. Imagine people shouting instructions to each other and running around checking on the state of the cube from different angles. 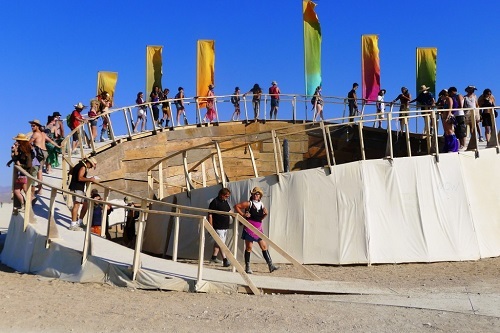 by Alissa Mortenson, Nebunele Theatre, The Temple of Shame was a 6ft wide, 18ft tall wooden Temple dedicated to the collection of shame from the participants of Black Rock City. The temple was ceremonially burned on the last night of the festival to symbolically release all the shame collected. Indeed: http://lsc.org/grooviks. We’re trying to raise funding for a new Groovik’s cube that will travel the World for 7 years together with Liberty Science Center and Erno Rubik! Hack more! Not satified with availability of hackerspaces near you ? Start one! It’s easier than you think and people come out of the woodwork to come and help and donate time and tools. Read more about ALTspace’s Groovik’s Cube project on indiegogo or on Mike’s website, or about The Shame Project on shameproject.org! You can read about more of ALTspace’s projects on their art page.